Author and world-renowned chef Paul Bocuse has chosen only simple, classic French recipes that are easy to follow and prepare. According to the chef, "Simple fare is, in my opinion, the best-the kind that I love to prepare at home for my family and my friends", and Bocuse in Your Kitchen teaches even the most inexperienced of cooks how to share his flair for good food. The book is divided into 15 chapters by type of dish; from soups to meats, vegetables, and desserts, each of the 220 recipes is explained step-by-step. Bocuse's carefully chosen dishes--from beef Bourguignon, blanquette de veau, and potato-leek soup; olive tapenade and old-style mustard sauce; to rhubarb jam, pears in wine sauce, and tarte Tatin--highlight the flavor of each ingredient, resulting in food that maintains its freshness and integrity. 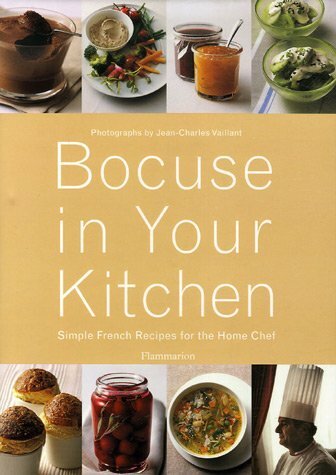 Bocuse in Your Kitchen includes 60 illustrative photos that serve to inspire, as well as a glossary of culinary terms and techniques. Beautifully designed and illustrated, Bocuse in Your Kitchen makes French cuisine simple and easy for the home chef.